The Boy, who cried Wolf! Once there was a shepherd boy who had to look after a flock1 of sheep. One day, he felt bored and decided to play a trick on the villagers. He shouted, “Help! Wolf! Wolf!” The villagers heard his cries and rushed out of the village to help the shepherd boy. When they reached2 him, they asked, “Where is the wolf?” The shepherd3 boy laughed loudly, “Ha, Ha, Ha! I fooled4 all of you. I was only playing a trick on you.”A few days later, the shepherd boy played this trick again. Again he cried, “Help! Help! Wolf! 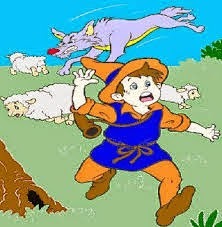 Wolf!” Again, the villagers rushed5 up the hill to help him and again they found that boy had tricked them. They were very angry with him for being so naughty. The villagers heard his cries but they laughed because they thought it was another trick. The boy ran to the nearest villager and said, “A wolf is attacking the sheep. I lied before, but this time it is true!” Finally, the villagers went to look. It was true. They could see the wolf running away and many dead sheep lying on the grass. 1. Name of English Queen? 2. Name of place, where English Queen lives? 3. Capital city of Scotland? 4. Largest city in Scotland? 5. The most famous footbaler from Wales (Gareth ….)? 6. Winner of ,,Gold Ball,, 2015? 7. In which cities will be Ice Hockey Championship in May 2015?